The marble and alabaster terraces and gilded cupolas of the Citadel of the She-Sultan receded in the distance; the road wound along the seacoast on a high escarpment. After purchasing horses and leaving their boat in the harbour, the characters were approaching the walls of Arfel. The road was empty of traffic, and there was grass among the stones. Finally, among a double row of crumbling statues standing on ancient columns, there was Arfel’s southern gate, or where it used to be: the entrance between the two round towers was walled up and obviously out of use. Beyond the wall rose dark and dilapidated-looking buildings. After circling a plateau dotted with shanties and chaotic clusters of houses, the party now approached the western gate, wide open with a motley gang of fighters in colourful garbs watching the road. They hailed the newcomers, and, after collecting their one gp fee, warned them about Arfel’s peculiar customs. The City State of the Charnel God was ruled by the cultists of Ozolba the Zombie God, and his immense, labyrinthine temple-complex dominated every view. All within the walls was free for Ozolba’s taking, and the veiled priest exercised this right without mercy, seizing anything and anyone they wished, and carrying it back to their vast necropolis. The city aristocracy was in turn a circle of noble families, who mostly populated the orderly but rather abandoned upper city: their windowless mansions like so many mausoleums, they observed the Necrotic Traditions, which ascribed a funereal life to both living and dead. Neither the priests nor the aristocrats concerned themselves much with worldly interests (or at least they hid them well), and therefore, civilian rule in Arfel was practically left to six Seigneurs. Their names were Salvar Afzal the Sailor; Rahman Rashid Uthman; the lady Zaida Shura; Omar Nezam the Alleyway Lord; Hyelmékshú; and The Crimson Man. The armed forces of the city consisted of their followers, and key points like the gates or the harbours were under common supervision. Inquiring about the nomad Gulai Mir, the characters learned that he was of the local aristocracy, and more active in various affairs than customary. The easiest way to approach him was through Zaida Sura, who kept a place named the Camelopardalis Tea House. 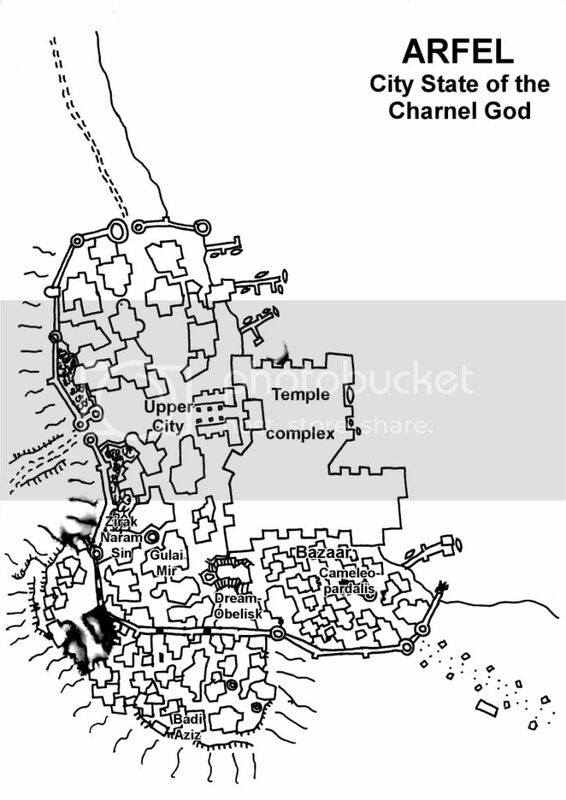 Traversing the empty and deserted upper city as fast as they could, the party headed down to the lower city, a dense pocket of bustling life bordered by the temple complex, two long and winding stairs, the city walls and the southern harbour. They headed to the tea house, a multi-level building full of gossiping locals; and ordering a cup of brew, they asked if they could have an audience with the mistress of the house. Zaida Sura received them in a back room: she was an older woman in blue robes, and when she heard they had done business with Gulai Mir, she immediately became more attentive. Yes, she had heard mention of them, and yes, she would be interested in buying the valuables they were eager to offload. She appraised the treasures laid out before her with expert eyes, and mentioned that she would be interested in more. However, some exotic objects were beyond her interest — the characters would need to bring them to the City of Vultures, where the noblewoman An-Raydn, the proprietor of the most exquisite trading centre, the House of Nezhat Quawar would find appropriate customers. As for Marasura, he had other interests: hearing about an ominous sorcerer in town, he ventured back to the southern half of the upper city, where lived Zirak Naram Sin in a black tower. His store on the ground floor was choked with curios, and the black-robed, hawk-faced wizard greeted his guest and customer. Here was a tragic mask for 50 gp; jacinth extract; a selection of magical scrolls yet unidentified; a ring that could ward from fire and – in the more affordable range – a metal cube which was a cylinder and now a cube again. The heavy little object was only 35 gp, and Marasura counted down the money to sate his curiosity. He returned to their rented room opposite the Cameleopardalis. The others had also done some shopping. Ambrosius purchased healing balms next to the temple complex, but soon discovered that he had been pickpocketed on the way back – all his money was gone. In his rage, he ran back to the streets shouting invective, but whoever did the deed was already far away. Meanwhile, Santiago surveyed the crystal tongue of Shriwasnar the Flayer. Experimenting with the now dull stone, he touched it to Marasura. The crystal glowed with savage inner light, and Marasura felt his Strength drained, as faint as a weak child. This was potent magic – not to be sold at the moment. The night passed and the next day, the characters paid a visit to the house of Gulai Mir to discuss the deal they were all looking for. There was at first no answer to the knock on the back door of the windowless structure. The streets were empty, only swept by the wind and walked by a few armed guards, and even they gave the palaces wide berth. Finally, shuffling steps came and the door creaked open to reveal an elderly servant. He lead them up to a wooden gallery overlooking a small inner courtyard, then showed them to an austere waiting room. He shuffled off, and they waited. Time passed; the house was silent and abandoned. Santiago paced up and down. There was more waiting. Burzasp listened by an iron door, but heard nothing. Finally, another entrance opened, and Gulai Mir entered the chamber. The merchant seemed better rested than he had been in the City of Vultures, although his skin condition, bandaged left hand and the odour of preserved spices around him did not make him much more fetching. He welcomed them to Arfel, apologising for “returning so slowly from his meditation exercises”, and remarking idly that much was different here in this city – “an entirely new set of circumstances, so to speak”. Burzasp soon came to the matter: here were, ah, a few suits of armour once worn by the Warriors of the Tiger, and if there was a more illustrious buyer than the great Gulai Mir, he sure did not know him. Gulai Mir flashed a crooked smile and was all ears – “an excellent opportunity to close a mutually beneficial transaction” – continuing that he would gladly take them for 300 gp apiece. The deal was made, and the characters quickly made a trip to their rented room to bring the merchandise while Gulai Mir retrieved money from wherever he kept it. This was a whole lot of cash and everyone did some more shopping, while Santiago enjoyed the charms of a wealthy lady he had met. As for Ambrosius, he was still pacing the alleys of the bazaar, when a hand seized his clothes. Opposite him stood a turbaned, bearded man. “I believe you have been the victim of a thief, my friend” – he smiled a broad smile. “How would you know that?” – Ambrosius countered. And with that, he bowed and turned, while Ambrosius also returned to the room, rubbing his hands in anticipation. “How can you know he isn’t leading you into a trap?” Santiago asked, his back to the wall in the cramped apartment. “How could I not trust a man named Murad the Honest?” – came the response from Ambrosius. “But who is innocent in this world?” – interjected Vifranavaz. They went, and the twin stairs were still live with traffic: merchants selling the works of Duri ibn Ghuti, the Burned Poet, and a few late passersby; fighting men in feathered masks depicting the heads of fantastic birds standing guard over the ancient steps; then the cold alleys of the upper city, west along the wall of a funereal palace, and south. There was some quarrel in a side street: dark figures, veiled and clad in voluminous robes were dragging a youth of some fifteen years from a house full of wailing women: but nobody wanted to intervene, and instead the party passed to the outer town through a gap in the city wall. A dark plaza with a central kiosk. Noises were coming from the east, a band of loud men approaching. The characters hid where they could, and only Ambrosius remained to greet the group. They were swarthy ruffians with scimitars and colourful clothes, and they were dragging with them three kicking and screaming boys. “Nice evening to you!” – Ambrosius greeted them jovially. “Maybe some other time – but give him my greetings, and don’t forget to give the kids a nice stern talking to” – laughed Ambrosius as he waved them farewell. The men disappeared in a large house nearby, and the streets were silent once again. “We will not be party to this.” Santiago eyed Ambrosius. “You are going to the house of someone who might not have done you a thing. Let’s go home.” There were voices of agreement. Ambrosius, however, didn’t budge one bit. He continued with Vifranavaz walking a short distance behind him, while the others turned and returned to the bazaar. As Ambrosius traced the moonlit streets, he heard a faint noise. He looked around, and the noise came again, from between two houses. A pair of green eyes stared at him, and a small kitten walked up to him. Ambrosius patted it and continued, and the kitten followed. There were more meows, and cat after cat came, joining him as if in a procession. He lead the way to the house with the tree-flanked portal. “I am coming, I am coming… just wait a bit” – came the tired response, and there was soon a light inside the window, then someone walked down a creaking set of stairs to open the front door. The light of a lantern illuminated the street, and the cats fled on a thousand soft paws, leaving only Ambrosius and Vifranavaz. The corpulent Badi Aziz looked at them, still uncomprehending. Behind him lay the store, neat shelf above neat shelf, all with rows and rows of mummified cat heads, cat heads in oil, in ointments, shrunken or cleaned to the bone. “I am Ambrosius” – he hit the man under his enormous jowl, sending him staggering into the counter – “and you give me my money back or else” – Ambrosius stepped after the bleeding form into the store. “Wha—get him! Get him, boy, you—“ the shopkeeper called, and there was swift movement from upstairs, but at the same time, Vifranavaz silently traced the lines of a hypnotic pattern spell, and Badi Aziz was instantly frozen by sight of the otherworldly colours. A moustached head appeared from above, but seeing his master was at the intruders’ mercy, the guard didn’t try his luck. Badi Aziz, now conscious again, asked him in a trembling voice to do as the gentleman will say, and the man soon returned with a locked iron box. They gave the fat cat merchant a shove, and dragged him with them back out into the darkness. Ambrosius closed the door and wiped his forehead. There was a hissing noise. He turned, looking into hundreds of unmoving yellow and green eyes, all fixed on them. A multitude of cats eyed them intensely. Ambrosius jumped to the side as he threw Badi Aziz forward into the throng. The stumbling body of the cat merchant disappeared beneath the swarming, furred bodies with a horrible, guttural shriek, and Ambrosius and Vifranavaz ran, through deserted streets and empty plazas, to the inner city and by shadowy palaces, down the Demon Steps and to the bazaar where their companions still waited in their rented room. Original date 16 March 2012 and 1 April 2012. Referee’s Notes: City adventures with action, skulduggery and intrigue, leading to an ominous and strange conclusion. Will anyone believe me if I say I rolled the horde of cats as a random encounter during the adventure, but only after I had already established Badi Aziz’s profession, and the contents of his store and house? It was truly too good to be mere coincidence. Did the cats want it to happen that way? I am not entirely unsure they didn’t.